From the mysterious subtleties of spoken poetry to the floor-shaking thunder of electronic kick drums, the Museum of Modern Art (MoMA) in New York has found a way to deliver the experience of music in a manner befitting its world-renowned presentation of visual art. When the concept of a retrospective exhibit on the music of Icelandic singer/composer Björk was first proposed, that was the challenge, according to Benita von Maltzahn, head of cultural and social affairs within Volkswagen Group Communication, and one of the key figures behind the concept of the exhibit. How can an audio-based exhibit deliver the same immersive, personal experience one gets from looking at a painting? Entering into the exhibit space, we were handed our assisted listening device: an iPod Touch connected to Bowers & Wilkins headphones. On the iPod screen, a transparent likeness of a human heart filled with neon-tube chambers changed color with each new music track, timed in coordination with our stroll through the ventricles of the exhibit. 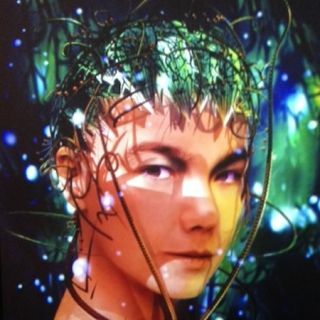 As we meandered through dark hallways and bright rooms, the audio shifted back and forth from soft, low tones layered beneath Björk’s spoken word poetry to driving, bass-heavy electronic beats and the soaring vocals of the singer’s recorded tracks. Throughout the maze, exhibits of handwritten lyrics and quirky outfits were interspersed with projected images and looping videos from ceiling-mounted projectors. After the tour concluded, we made our way down to the gem of the exhibit: the presentation of Björk’s newest music video, “Black Lake.” After waiting in a queue, we shuffled into a dark, seatless theater with projection screens on both the front and back walls, their ultra-wide video aspect ratio achieved by synchronizing two Canon projectors per wall. Despite the dual screens, it was immediately clear that the music was the star of the show. Along each sidewall were eight large Bowers & Wilkins speakers providing the low-frequency grounding for the array above: 24 smaller B&W satellites placed strategically into the thick foam soundproofing that resembled a volcanic landscape. As the 10-minute presentation commenced, video of Björk twirling and squirming rhythmically about the igneous gravel of an Icelandic setting was accompanied by the main show: the intricately choreographed, object-based audio performance originating from the Barco IOSONO CORE three-dimensional audio processor. The music, specially mixed for the IOSONO system by Marco Perry for Immersive Audio, was delivered with the sort of visceral punch you might expect from a dance club sound system, yet with the clarity and finesse of a meticulously crafted audiophile system. Mauer added that the IOSONO CORE processor also acts as a speaker controller, measuring and adjusting for room loading and other factors in real time for the system’s high-end Classé amplifiers. The resulting performance was a sonic work of art. Björk’s trademark sound, a breathy, legato vocal delivery punctuated with alveolar trills, flowed delicately over pads of orchestral strings and booming bass drum kicks. The minimalist quality of the music worked perfectly with the intricacy of the sound system: each musical voice was easily identifiable, despite the vast number of speakers.